Now Completed! 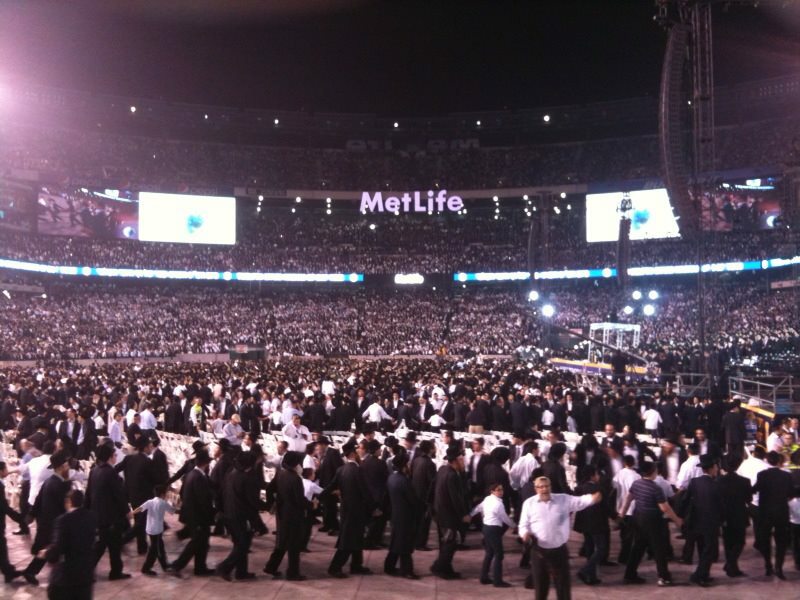 The 12th Siyum HaShas - which took place last night - was billed as the largest celebration of Jewish learning in the last 2,000 years. In any event - the celebration filled the MetLife Stadium in New Jersey with nearly 100,000 people. On August 1st 2012, 95,000 Jewish people from all walks of life gathered in the Metlife Center in New Jersey to celebrate the 12th completion of the seven and a half year cycle of the Talmud. The program is for each person to complete one page of Talmud a day, with everyone in the world doing the same page. What's a siyum? What's the Siyum HaShas? MySiyum.com helps us with the basics. What's a siyum? Siyum is the Hebrew word for the celebration marking the completion of a significant Jewish text. What is Daf Yomi? "Though Talmud can be learned by anyone at any time, Rabbi Meir Shapiro of Lublin proposed the novel Daf Yomi (page-a-day) concept at the First World Congress of the World Agudath Israel in 1923. Following this unique approach where Jews the world over study the same page of Talmud each day, disciplined students can complete all six orders of the Talmud – 2,711 pages in all – in a seven and a half year stretch." And - lest you think that Daf Yomi is strictly for the black-hat ultra-Orthodox wing of Klal Yisrael - Abq Jew encourages you to read this JTA report. Or even better - check out page 12 of the August 2012 edition of The New Mexico Jewish Link for Tori Lee's personal essay Daf Yomi - A Page of Talmud a Day. What are you doing between now and January 4, 2020? Have some room in your schedule? Then you can join the worldwide community of Talmud learners as they begin the 13th cycle of reading the entire Babylonian Talmud, all 2711 pages, at the rate of one page (both sides) per day,beginning with Tractate Berachot on August 3, 2012. What is it like to finish? See here! And make it easy on yourself - see E-Daf.com! Jews from all walks of life have found relevance and meaning in Talmud, this historic and saintly work. the heartbeat of the thinking Jew and the pulse of the eternal nation!